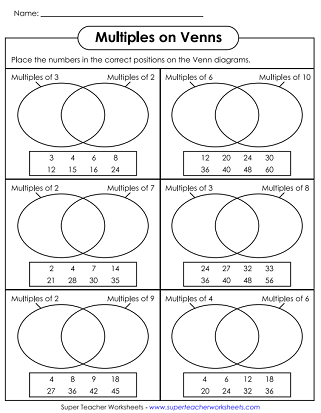 This page has a set printable Venn Diagram worksheets for teaching math. For Venn Diagrams used in reading and writing, please see our compare and contrast. Complete each V.D. by copying the numbers from the box into the correct place. 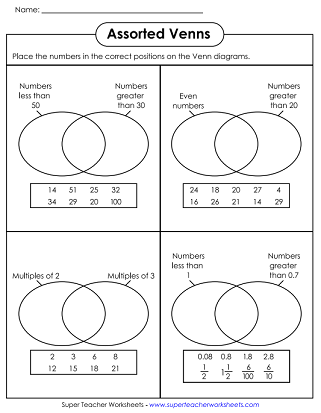 List factors of the given number pairs on each V. D.
Sort numbers on the Venn diagrams to show which numbers are multiples of the given numbers. This is a slightly more advanced version of the activity listed above. This page has a large blank VD that takes up a whole page. 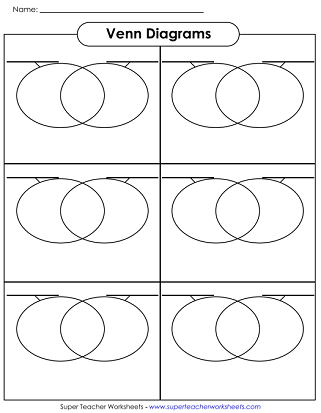 This page has 6 blank Venn diagrams. Teachers and/or students can fill them in to create custom lessons. Here's a VD with three overlapping circles. Here's a set of reading and writing worksheets on comparing and contrasting.